This ambitious update focuses more on the overworld, including terrain generation, and world generation as a whole. 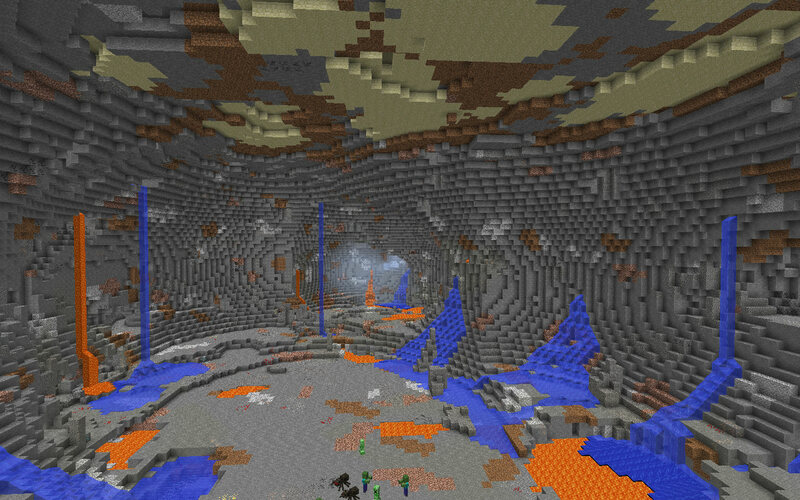 The update will be modifying mainly the world height, and underground. Feel free to leave your ideas. The world height will be changed drastically, to allow more underground space. The current world height is 256 blocks. With the sea level at 62, this leaves us with only 61 blocks to play with underground. 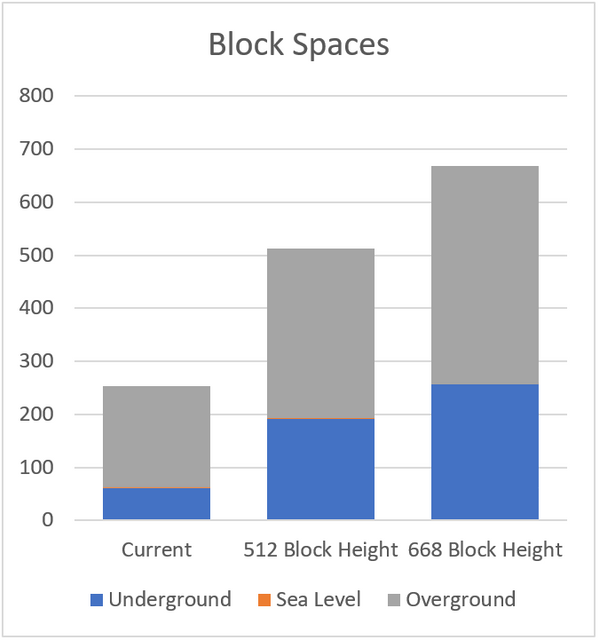 An upgrade to a 512/668 block height with a sea level of 192/256 leaves us with enough vertical height for over and underground. -Requires more disk space and ram. -Requires more processing during generation and loading. -Technology is progressing fast enough that lower end computers should be able to support this. I can see only two viable ways the update can be on older worlds. Worlds that were made before the update would just have a 512/668 vertical block height limit. If Implemented properly, people can convert their worlds to the new generation. The already modified chunks will be raised up to the new sea level, bedrock will be removed. Everything below bedrock, and unmodified chunks, would generate normally. The real world has layers in its rock. It isn't all completely stone. Minecraft should have this too. The deeper you go, the more andesite, granite, and diorite you should find. They are all igneous rocks and thus only make sense if found more relatively near lava. The generation of ores would be also affected by this. This is my idea of the new ore generation. Cave generation today is kind of weird. It is random, yet redundant. Nothing ever happens underground. Generation of caves would be in a more exponential way. Either it is a few caves or a massive intercontinental system. This type of generation focuses on more horizontal caves instead of vertical ones, although they would still exist. This generation starts with a "seed" that can branch out in all horizontal directions. This type of generation focuses on a tree like generation. "Seeds" are planted and caves sprout from it in a branch way. Seeds may grow in to any direction they choose to. Extremely Rare. This generation focuses on sticking as much interesting stuff as possible in an interconnected system. This system would be vast and there will essentially be no end of caves(there is but more of taking you a loop back). This would be more common than the others. This would be focusing on scattering small caves. Caves can spawn using different blocks. General caves can opt out of "just cutting" and generate their own floors, walls, and ceilings. They can use, all types of stone(adding cobblestone and mossy cobblestone), and mixed natural blocks(dirt, coarse dirt, sand, gravel, and clay). While there aren't tectonic movements in Minecraft, this can be perceptibly simulated by having cave suddenly jot down or up. This does not have to be sudden. It can be more gradual if the cave wants to look older. The cave system today is very dull. Nothing ever happens except for occasional dungeons, mineshafts, and rarely - strongholds. Here I will list things that could amp up the underground. Rare, Medium to Large sized caves. They are relatively horizontal and flooded with 1-2 block deep water. They can spawn anywhere but more commonly near water. They can spawn sea grass. The cave is also full of vines and mossy stone. Very Rare, These are round chambers that are 8-30 blocks high. They are full of spike-shaped stone and is rich with coal and diamonds. The lowest point of the chamber to 3 blocks up will be filled with water. Water will also be dripping down from the ceiling. Extremely rare. They appear at bedrock level up to 30 blocks above and are at least 45 blocks horizontally. The place has lava falls falling from the ceiling. The bottom is also full of lava, around 3-4 blocks deep. The chamber also has some spikes. Black stained glass, diamonds, obsidian and coal blocks can be found here in respectable amounts. The place is also covered with tinted fog. Everything here also has heat damage halo. Very Rare, spawns 5 blocks above bedrock. Has a higher chance when near a mushroom biome. 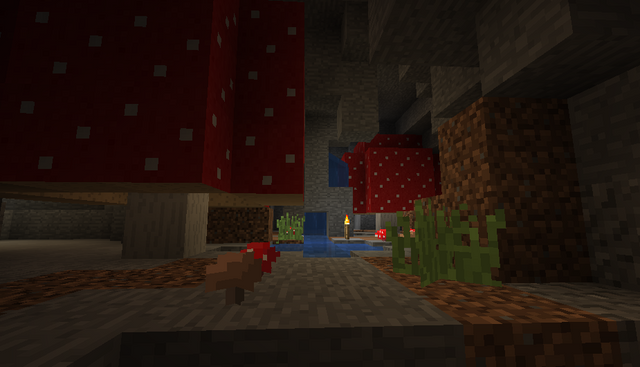 This chamber is 15 blocks tall and contains water, and both mushrooms and tall mushrooms. A reasonable amount of bats dwell here. No monsters spawn here. Extremely Rare, spawns 5 blocks above bedrock within a mushroom biome. This is an amplified version of the Mushroom Chamber. It is 35-55 blocks tall with beautiful cave supports and ridges. 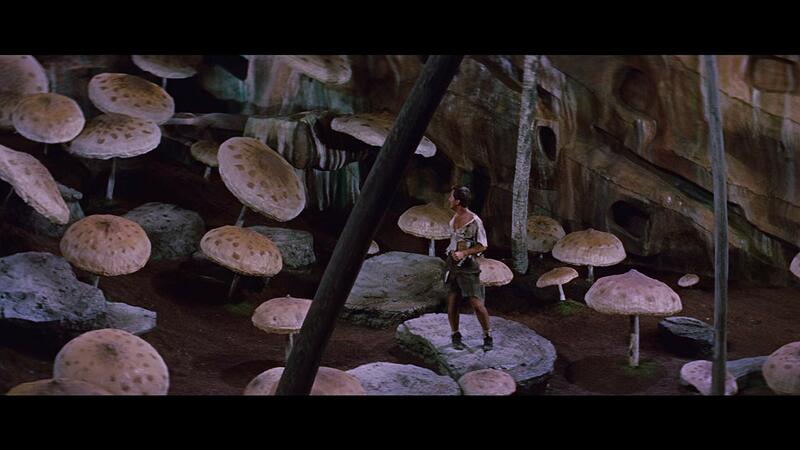 This place is rich in mushroom, tall grass and bats. No monsters spawn here. Very Rare, only in Deep Sea Oceans. Trench is a rare drop in deep sea oceans. The drop make the ocean as deep as 20 blocks above bedrock. The Trench opening is a hollow hole with anti-depholigisticated air. The trench itself is full of broken down ships layered on top of one another. Inside the opening there are strays, spiders and skeletons. The chamber also has a hybrid of loots from ships, temples, and dungeons. Rare, Ravines can and will only cut through/ generate above sea level, till down 32 blocks from the surface. Very Rare. It is an amplified version of a ravine, longer and wider with more levels. Cuts through from sea level till 20-40 blocks above bedrock. It has two varieties. May be found only in warm oceans or anywhere on land but on desserts , plains, mountains, or savannas. It can be teeming with trees, animals, water falls; or corals, fish, bubble columns. Can be found anywhere in the world. It is just a large crack. Extremely Rare, spawns 25 blocks above bedrock. This is a large hole underground that is supported by columns. This may also house spikes, and spiders. This cavern may or may not be filled with water, let alone completely unless under the ocean. It is also filled with anti-dephlogisticated air. Rare, can spawn 10 blocks above sea level till 35 blocks below. Spawns Stalites. It also has water and water drippings. Very Rare, spawns between 40-70 blocks above bedrock. It is a large cavern with fossils, webs, skeletons, water, and spiders(both variants). It alsp spawns spikes shaped like stone. Most spiders will be on the ceiling when this is generated. Rare, spawns between 25-100 blocks above bedrock. It is a small pocket that contains Oil, and air. Just under it should be bone blocks, coal ores, and rarely coal blocks. Rare, spawns relatively near bodies of water. Can spawn at any level, not going above sea level or below 30 blocks above bedrock. It is full of vines hanging from the top, water at the bottom with sea grass and seaweed. Bats may also nest here. Very Rare, spawn 15-45 blocks above bedrock. It can be 65-80 blocks tall. They feature terraces than may contain waterfalls, mushrooms and possibly flowers. Impossibly Rare, lowest point can start spawning spawns 5 blocks above bedrock. This structure could be as tall as 148 blocks and be as wide as 1024 blocks. Could house most structures listed here. They are placed in a terrace like manner. A structure like this isn't limited to just one terrace. Very Rare, spawns 15-30 blocks below sealevel, beside an ocean. It can be 35-55 blocks tall, cutting through landforms. The structure is in a midpoint between Large Cave Terraces and Cave Terraces. Water rushes in from the sea creating natural waterfalls. Very Rare, spawns between 30-80 blocks above bedrock. An obloid room full of fossils, coal, coal blocks, and some oil. Rare, small to medium sized cave. The cave ceiling is made from gravel or sand. Very Rare, found only in ice spikes biomes. Found on the surface. They are cave that are made of pure ice and snow spike formations fill the cavern. Ice blocks inside here glow light with a brightness level of 1-3. Water inside glows at level 4. The structures located underground today are quite dull. They function as much as they look. A good revamp like what they did to the villages could make the game more groundbreaking. Rare, spawns 60-100 blocks above bedrock within 512 block radius of a village. A Lost Villager has lost his way and decided to make a home underground. With his limited sources he has built a small farm and small house. Valuable loot can be obtained from his chests. If you could lead it back to the surface(using a lead), it would start finding its way back home. Very Rare, can start spawning 50 blocks below sea level. They will contain larger rooms with better builds. The build would be more organized but will have hidden rooms. The center point of the build would be the End Portal. The room would be much more decorated and protected. Uncommon, can start spawning at any level. They will contain larger shafts. Shafts may contain multiple track lines that branch out to other places. They now show visual proof of "already dug out places". They would now have stairs that lead to other levels. They also will expand to near caves. Rare, can start spawning 30 blocks below sea level. They will have a more natural shape. They would be more incorporated with caves rather than random cubes underground. They could house a prisoner or two, or skeletons. They could have prison cells, armor loot, food loot, etc. Very Rare, can start spawning 70 blocks below sea level. They are similar to strongholds but have more prison cells and look more abandoned/weathered. There could be chambers inside where spawners are located. Loots here are same with stronghold loots. They may house living or dead prisoners. All will have spiders inside. Extremely Rare, spawns only in Extreme Hills. Spawns on bedrock. This is a large structure similar to a stronghold, Big Dungeon, and Jungle Temple smashed together. They will host illagers (no spelling mistake) with villagers as prisoners. It will be guarded by pillagers. It is also protected by turrets that shoot off you and other monsters. Everyone inside have custom AI. They all run on schedules providing food and protection. They also guard the portal and extremely valuable loot from both the nether and end. Video where my thought is, although very ambitious and far from reality. This explains the effects stated above and how they affect or be affected by the player. These are all stackable. Purely Aesthetic. This Fog only affects the air blocks inside the specific chamber. They use the same mechanics as normal fog. They can be tinted at generation. They can be removed by exposing at least one block to sunlight, a chain reaction will occur. The fogged air blocks spread back to normal air blocks within the chamber that isn't exposed to sunlight. Does not spread to new blocks, only to pre-infected blocks. The player takes damage where ever this modified air is located. A flame effect can be seen in the effects tab. It lasts while the player is in it. If the player stays inside for longer than 5 seconds, the player will start burning(with fire). Can be countered with Fire Resistance Potion. Does not spread to new blocks, only to pre-infected blocks. Air block that does not contain oxygen. Mobs will only start to lose oxygen being 10 seconds inside this block. Will be removed once exposed to sunlight. It would take 2 minutes before you start taking damage. Can be countered by drinking a water breathing potion. Does not spread to new blocks, only to pre-infected blocks. It acts as the 'only place where certain mobs can spawn'. Can be removed with exposure to sunlight or replacing the blocks. Much less invasive "spawner" but still quite easy to remove. Does not spread to new blocks, only to pre-infected blocks. This contains all new mobs that can be found in general and specific underground structures. A new variety of bats. They are darker than the normal bats. They will always be hanging under blocks unless disturbed or is night. Attacking one will result in every damage bat within 20 blocks to wake up and deal 0-1 heart of damage and knockback. There is also a small chance of them dealing poison effect. They only attack once then fly away. A special type of villager destined for loneliness. Finding it will give you XP and gifts, returning it to its village will give you more gifts and XP. Just a special skinned villager with a modified 'AI'. When the Villager is on the surface(detected by sunlight), it will hold a compass an move back to its village. You can follow it to find a village. They can now rotate and walk on surfaces. They also would have more sizes, from 0.5x of the original to 1.5x. They can also 'web down'. This would produce a string that would disappear once the spider has done what it was supposed to do OR when something hits it. If the player hits it, the spider would drop and the player would receive slowness. A special type of villager that travels with a cartographer. They travel to the nearest other village for trading. Travel is not affected by chunk loading. Once they spawn, game ticks start defining their position. Upon arrival to the new village, they will stop their until the village is loaded. They may also appear in fortresses. They are what stalk each room and say to guards of your presence. If you kill them before they escape, guards wont be able to track you down, unless they see you. They roam the facility checking for predators and run to the nearest force when there is. Listed here are things that should be added to help enhance the vibe of the update and make things blend more nicely. Uncommon. Found more - nearer a body of water. Acts like sandstone. Is used to make concrete. Whiter than sandstone. Can be made into and from Limestone Sand. Rare. Generalized name for both Stalagmites and Stalactites. Found in Limestone Caves. They stack when you place one on top of another. A column will be made if connected stalites reach floor to ceiling. Can be made into Limestone Sand. Rare. Acts like lava but without the damage. Found underground. It can be ignited, and will "burn away" over time. Diving inside it will give you slowness, nausea, and blindness. Can be picked up in a bucket and used as fuel. Very Rare. It makes everything Nether Quartz can make. Breaking it would give you quartz. It can appear in many forms but will always look like white glass. -Quartz Spike. Can be place on top of one another up to 8 alone, and 24 in a 4x4 grid. Multi-directional and can connect diagonally. -Quartz Stone. 80% Opaque, looks like white stained glass. Spikes can connect to this and will automatically connect edges. Found in Fortresses. They are made from a beacon, a conduit, and an end crystal. It attacks what ever mob head is placed inside it that is within 15,30, or 45 blocks. They are as hard to break as obsidian, and require a diamond pickaxe. They deal 1/2 heart upto 1 and 1/2 hearts of damage. Uncommon. Stone block with moss. Can be crafted with 4 stone and one vine. It has been mentioned that swarms of bats would cause a lot of lag. Here i propose that bat swarms be treated as special entities - particle entities. A host bat is chosen and spawns "fake bats". Fake bats can only be seen at generation. They generate with structures and only render when someone has an eye on it. Normal bats aren't affected by this. Chunk will now equal to a 32x32x32 cube instead of 32x32x255. A Render distance of 12 on sea level would mean 2 chunks will not render underground and 2 chunks in the sky wouldn't render. Items can be placed on ground, different from a dropped item. An item placed on can only be removed when a player interacts with it or flowing water pushes it away. You can change its orientation and special items can 'stand', e.g. bottles. Naturally generated stone will no longer always have the same hardness/ breaking time. The deeper you go, the harder, longer, and more durability it takes as you mine. Starting from sea level down, stone increases hardness by 0.15x. Things emitting light underwater would have a longer spread of light upwards and can be visibly seen through "fog". If you didn't get the 'Caveat' pun, where's your house? - considered ScotsMiser's ideas and arguments. First cut: this has a much higher chance of garnering wide support if it does not include a major rewrite (ie increasing the world height). Is there anything special about "spike-shaped stone"? Does the water dripping from the ceiling repesent the normal effect (water one above) or isthis seeking to change part of MC 'physics'? Making coal more common seems to be a non- or minor issue; diamonds are another matter. 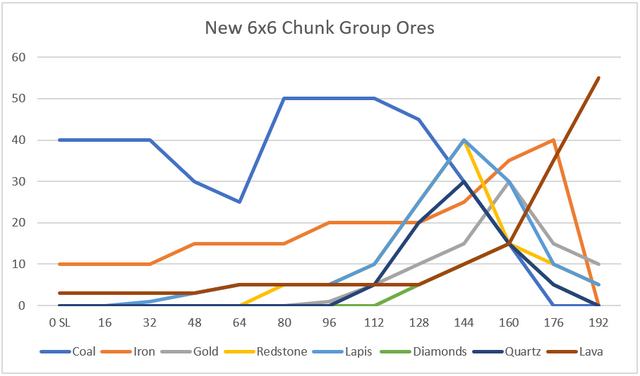 Given the pushback to a proposal to add ~1 extra diamond ore per 4 chunks, I would not expect this feature to escape unless it replaced rather than supplimented current ore generation. Have just noticed that I was assuming your phase "rich with coal and diamonds" refered to the ores, is this the case? Other than the diamonds and coal (see above for discussion of these) & black stained glass, these already generate although rarely. It would also appear that the heat damage halo belongs here, but no mention is made. Unless the loot is very good (far better than normal chest loot, and commensurately rarer) this might be better kept as a point of interest and an underground indicator of a (comparatively) nearby village. Xp is generally too easy to get by the time it is useful for this to be valued; and I'd just as soon keep the RPG elements to a minimum. From the description these would have to be brown-coat villagers for the fields to be worked which seems odd…(although a simple cosmetic only reskin might be viable). 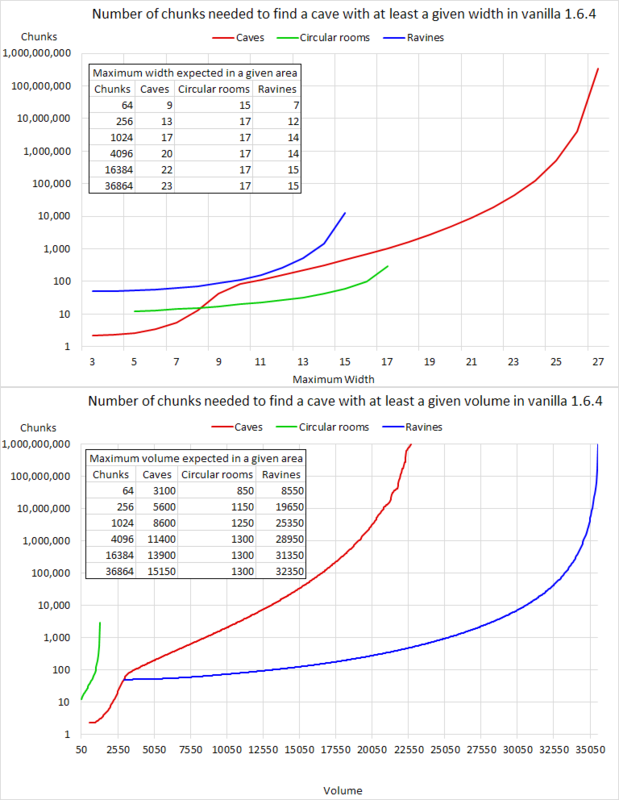 Much of the effect could be gained by simply allowing a small chance that generated unserground mushrooms could become the huge versions provided there was sufficient space. Props on anti-dephogisticated for deoxygenated, but doubt an such a bit of archaic esoterica stands much chance of being added. Loot is mentioned as being inside, but is not specified. While nothing requiring oxygen could exist in such an environment, why are not at least the various undead mobs possible? This seems like either a pure aesthetic addition, or one that simply obscures vision; neither strikes me as particularly desirable and the spread and removal mechanics seem like they might require excessive computation. Lava already produces a form of this with air blocks within the affected volume being subject to randomly bursting into flame. Even if there were no means of transporting/relocating the effect, it would introduce another kill method for certain mobs (probably all the non-undead except endermen) and would introduce another means of filtering spiders and creepers from the output of a mob farm. Not bad as a point of interest, but would suggest bringing within the boundary of any village be sufficient. What about changing that from lost miner to lone miner? And (s)he may be an indicator for a nearby rich deposit or rare ore(s). Exactly my inspiration of this idea. The whole film and some science stuff is what i am basing this off with. Thanks for the feedback. I've fixed things that also seem wrong to me. I am thinking of workarounds with things I can't generally control. A far as increasing the world height to have a deeper underground goes, I've made mods that made the underground up to 3.5 times deeper myself with caves and other underground structures scaled up and I have to say that I much prefer the current depth; even as much as I like caving and the much bigger cave systems prior to 1.7 scaling them up by a factor of 30 or more is a bit too much (IIRC I used over 20,000 torches in a single cave system, which also yielded around 60,000 ore based on my current torch/ore mined ratio), and there is the fact that the reason why Mojang made cave systems much smaller in 1.7 may have been because people complained that they were too big and/or interconnected (IMO, if you just have a bunch of small isolated cave systems there is no fun in caving; I want to be able to explore entirely underground, not have to look for new caves every hour or so; nearly everything seen here is interconnected). I agree. An interconnected cave system would be more fun to explore than trying to find isolated caves by digging at random. Especially with the addition of rare/specialized chambers, it could give the impression of a rich underground ecosystem. I have added clarifications with how caves generate based on what you have said. I just think minecraft does not have enough mining. From my perspective, i think it would be more fun if players get access to small systems but need to be lucky or dig deeper to find the better stuff e.g. large cave systems and rarer structures. I've just read your Nether Update thread and wow, you make good suggestions. It all made more sense now. I don't really think that you could toy with the world height but I do have to say, your methods of fixing possible destructive events are viable. The underground today does lack alot of stuff. I do really think they need an overhaul. I've also done some research into what you have suggested, most of them came from the real world(caves and world layers anyway). This could really help in teaching students about geology(yay earth science). I honestly doubt this would all get added, since this really is alot. But, seeing as how the Village and Pillage Update came about, I see no reason why not. The game really needs an Underground Overhaul. Thanks for the feedback. Alot, of people did say that these suggestions could get more support if I didn't have to play with the world height.